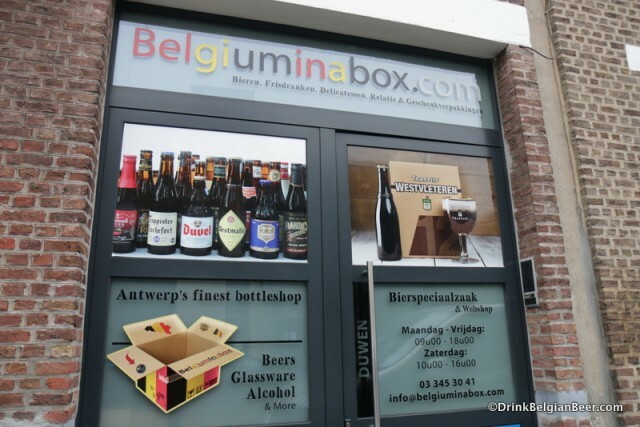 I have great news for visitors to Brussels who would like an easy and secure way to ship beers they have obtained in their travels back to their home country: you will now be able to do so through Belgium in a Box, Belgium’s premier gourmet on-line beer shop and packing and shipping service. 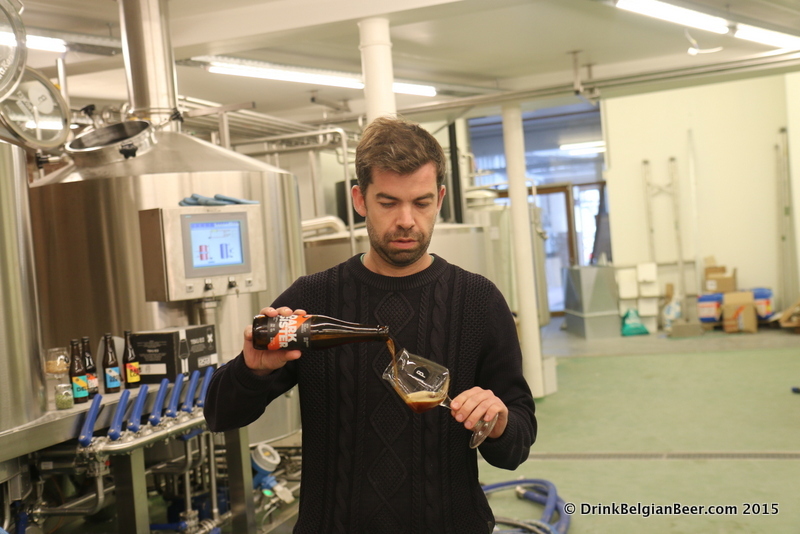 Sébastien Morvan, co-founder of Brussels Beer Project, with the brewery’s Delta. It’s kind of an IPA/Saison, and delicious. BabyLone, which is described by the brewery as: a BREAD BITTER, THE FIRST BEER BREWED WITH RECYCLED BREAD! 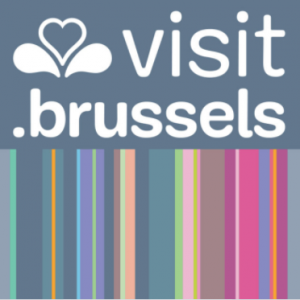 This means that if you score some take away bottles at Brasserie Cantillon, that you could bring them to Brussels Beer Project, where they will take possession of the bottles, take your name and information, and provide it to Belgium in a Box (“BIAB”) and owner Kurt Verbiest. 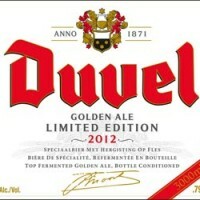 Belgium in a Box can then pick up your bottles and take them to their shop in Antwerp for packaging and shipping. 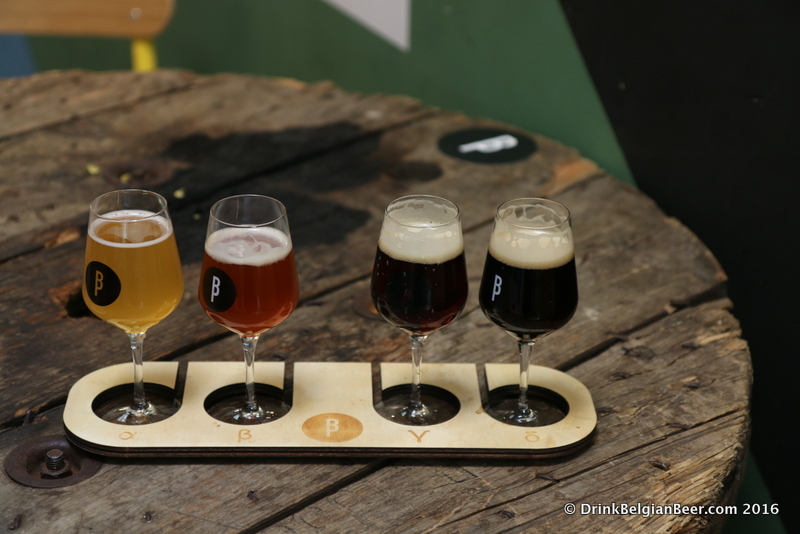 ***Important note***: A requirement to utilize this service is that you must purchase at least one tasting flight of four Brussels Beer Project beers, at a cost of eight euros, during your visit. 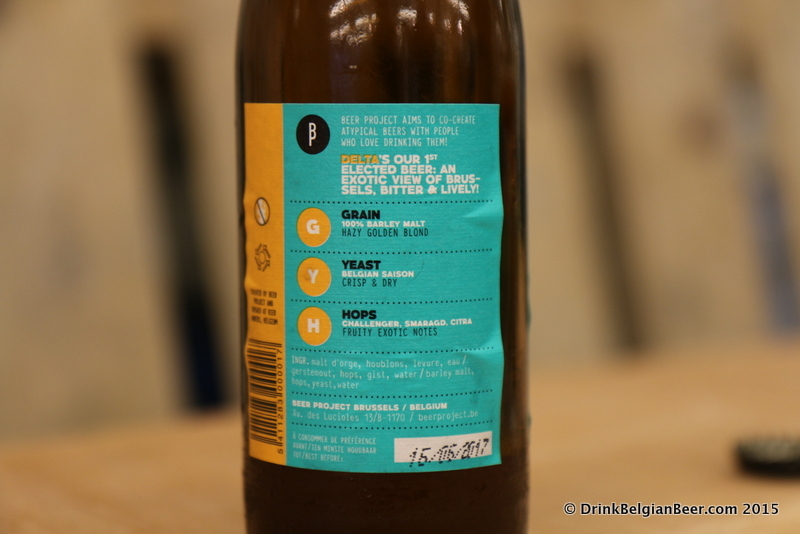 The Brussels Beer Project beers are very informative. No hiding ingredients or secrets here. 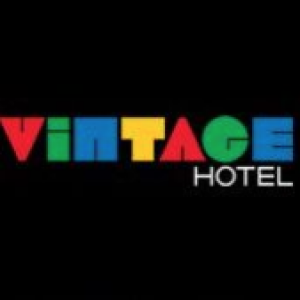 This is the back label of Delta. Shipping costs will vary depending on the destination. See the website for details or send a mail to: info@belgiuminabox.com. 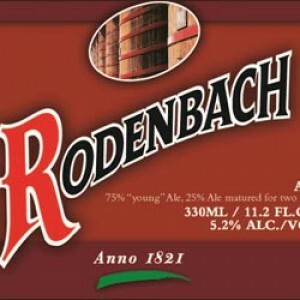 If you want to have beer shipped home that you bought somewhere other than the BIAB shop, BIAB’s packing fees are as follows: 15 euros per 10 kg (22 pounds) of products, and 45 euros for a 30 kg (66 pound) shipment. Note that shipping a box that is just under 30 kilos will give the lowest shipping cost per bottle. Note that about 29.9 kilos or so would equate to about 18 bottles in the 75 cl size, or about 33 bottles in the 37.5 cl size. Dropping your bottles off for shipping at Brussels Beer Project (BBP) leads to a bonus brewery/taproom visit: BBP is open from 2 pm to 10 pm Thursdays through Saturdays (and those are the only days and hours that you can bring bottles to drop off for shipping.) 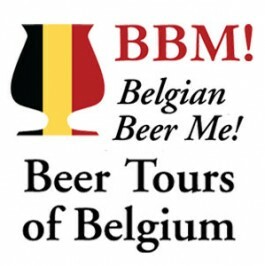 If you like the interesting and innovative beers on offer at BBP you can buy any available bottles and have Belgium in a Box ship them with the beers you brought in. 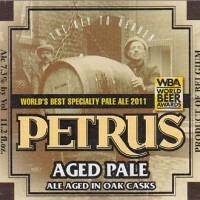 Or, you can just go to BBP and buy bottles on site, and have BIAB ship them. 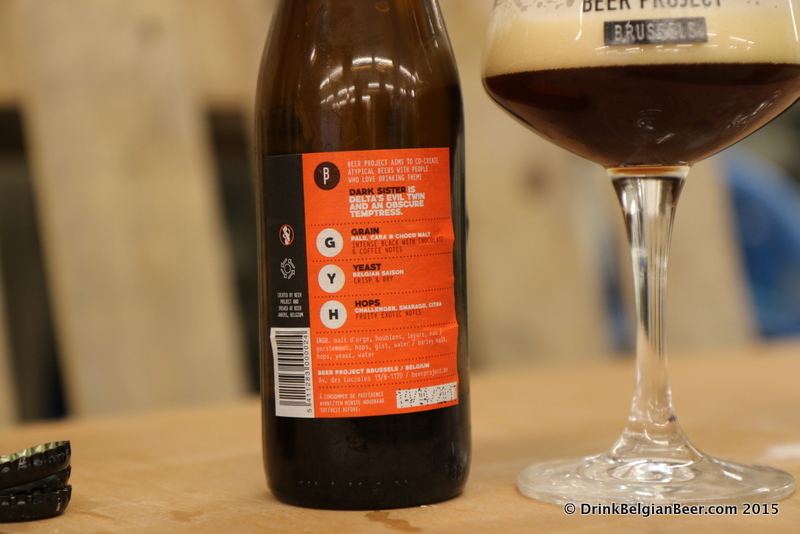 The back label of Dark Sister from Brussels Beer Project, a black IPA. 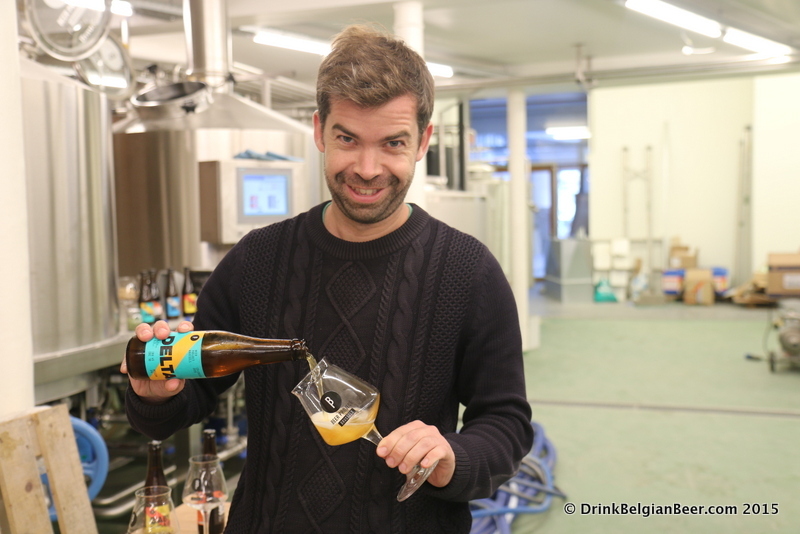 Brussels Beer Project was started with crowdfunding in 2013, and they opened their brewery at Rue Antoine Dansaert 188 in Brussels in 2015. Co-founder Sébastien Morvan told me that he and his partners brew beers without regard to stylistic guidelines. “We brew innovative beers that people like, and are not restrained by styles,” Morvan said as we toured the 500 square meter space in 2015, which is said have been occupied by a brewery up until 1914, when World War I started. A lineup/flight of tasters at BBP. 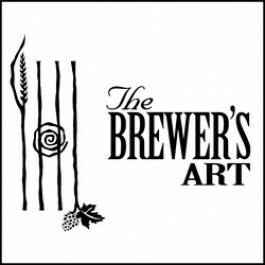 BBP has brewed many dozens of different beers and has collaborated with a number of different breweries. There are numerous barrel-aging projects in progress as well. 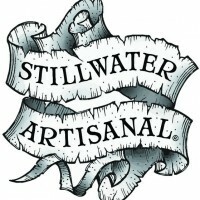 There are usually around a dozen different beers on tap in their taproom. 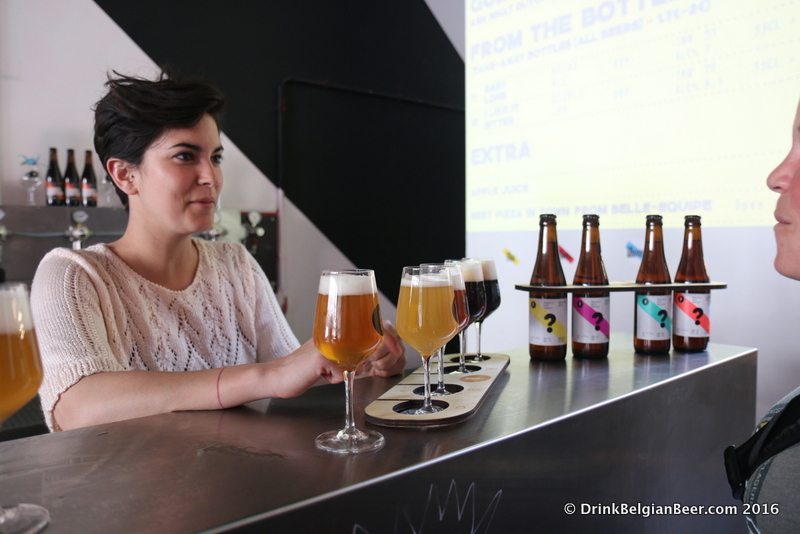 Bottom line: the BIAB shipping service and a visit to Brussels Beer Project are a win-win combination for any beer lover visiting Brussels. 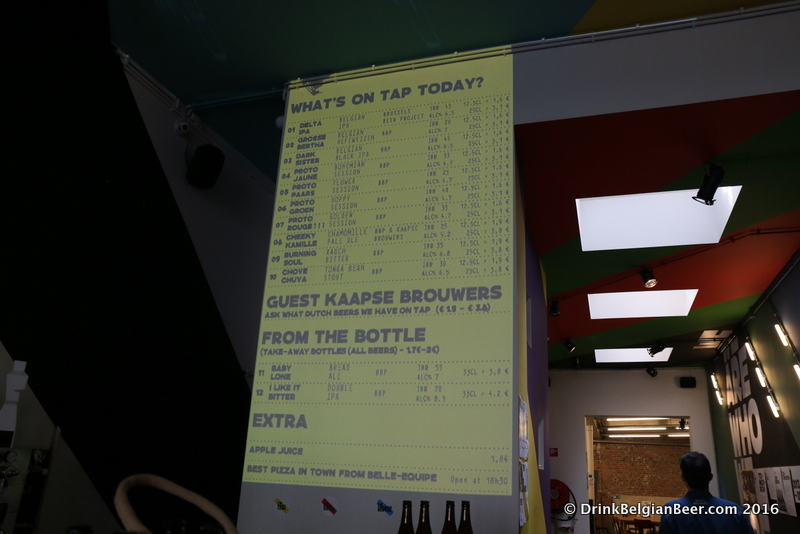 The menu board of available draft and bottles beers in May 2016.